eight-hour flight delay and the entire plot changes. So what should you do if your plane is canceled or is severely delayed? Here is your 10-point action plan, which keeps time-strapped parents in mind. And we’re off! Carrying on meant maximum flexibility for E and me when our flight plans went sideways. Let’s set the scene. You’re desperately trying to keep up with your kids as they dart off, licking waiting area seats and running down jet bridges. There’s a gargled announcement on the loud speakers. You feel your phone vibrate. You see red letters popping up on the airport’s flight information display system. And by the time you figure your plane has been canceled, the rebooking line is longer than the cue to the Wizarding World of Harry Potter. Is it just me, or are gate agent computers from the dark ages (otherwise known as the early 90s)? If your flight is delayed or canceled and you want to jump on another flight, take an alternative route, or request a ride on another airline, approach the gate agent with that information at the ready. Otherwise they’re just going to re-book you the flight that their computer suggests. The clearest alternative route is going to be your airline’s next available flight(s), so check your airline website’s options first, keeping in mind that flights within the next hour will not be listed. You’ll find those flight options on the information display system throughout airports. If you need to search for more complicated routes—trips that are now going to include new or multiple connections, alternate airports, different airlines, and so on—you’ll have to do a more thorough search. I know it’s hard to Google options on your phone when your children are toddling towards escalators and attempting to steal snacks from WHSmith. Apps can help speed up that process. —FlightAware This free app tracks the status of all flights at any time. If you’re flying direct, type in your departure and arrival airports and every flight option on every airline appears in a clear list. — If your Wifi is slower than Lonesome George (RIP), delegate. Call a friend or family member and see if they can do a quick search for you and text you their findings while you stand in line or hunt for a toddler leash. Rebooking lines can be long and move slowly. Call your airline, with your preferred next steps in hand, while you wait. Often times the problem is solved faster over the phone, and you may just snag those last empty seats before the person in front of you. You can also see if a representative at another gate can help you, though airlines often try to corral everyone to one help area. If your airline can’t get you to your destination within a reasonable time frame, can they book you on competitors’ planes? Yes. Says the Department of Transportation (DOT), “While airlines are not required to put you on another airline’s flight, they can and sometimes do, so it does not hurt to politely ask.” From personal experience, this is extremely rare and will likely only happen with legacy airlines (American, United, Delta) when their own options are completely exhausted. Again, having your requested flight requests at the ready is essential, as is being nice. Are you a silver starred, dyed in gold, dipped in diamonds elite status member of your airline? Flaunt it, baby. If you have access to an airline lounge, head to that desk for a quieter scene and more personalized service. And when working with any airline representative, mention your status. Not getting the help you think you deserve in person? “I advise people to try Twitter with some airlines,” says travel expert George Hobica of Airfare Watchdog. “JetBlue and American are speedy repliers.” Be polite, he adds, even online. If you’re traveling on a particularly important trip—a wedding say, or an important family reunion—it might be worth investing in Freebird, which costs $19 per ticket and must be purchased at least three days before your trip. This app and service works like flight insurance, with a serious twist: When your flight is canceled, it will not only find your new flight and book it within minutes, it will also pay for it on the spot. In other words, you don’t have to file a claim and wait weeks for your refund. If you believe you are due compensation for a canceled flight or severe delay, pursue a reimbursement. Again, with limited time on your hands, it might be worth outsourcing this task. AirHelp will track down your rightful compensation for a delayed or canceled flight. For a fee that’s deducted from your compensation, the program will also file claims on your behalf for flights within the last three years. Disney or the airport? OK there’s no comparison, but more airports have local restaurants and even playrooms for kids. If you can manage to carry on your luggage, you’re in the best position if your flight plans turns sideways. “Carrying on gives you maximum flexibility,” says Jamie Harper of Fly By The Seat of Our Pants, a blog about her family’s adventures as stand-by world travelers. 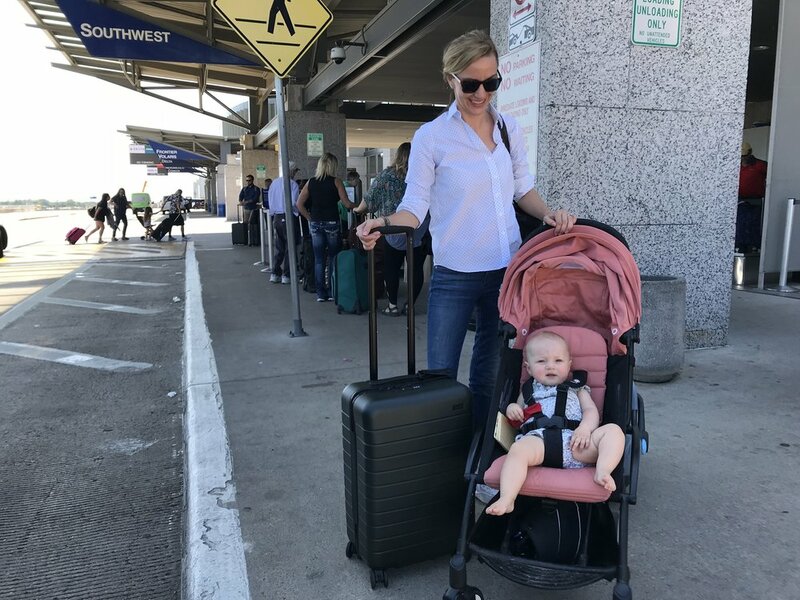 Thanks to the fact that she and her children have everything on their person, they’ve been able to jump on close connections they would have otherwise missed had they checked bags. They’ve also flown to different airports in nearby cities instead of their original destinations. Both of these options are closed to you if you check your luggage and gear. Did I mention Jamie has four kids? If she can carry on, so can you. If you’re a frequent traveler, you’re going to get stuck sometimes, so be prepared. Is your baby still in diapers? Bring a few more than you think you’re going to need. Do you have a three-year-old who needs constant entertaining? Download GateGuru to see what fun you can find at the airport. Some, like Dallas Love Field, have playrooms. Many now have local city restaurants, like Bun Mee at San Francisco International or the Peached Tortilla at Austin Bergstrom. More and more airports have breast-feeding pods and family bathrooms as well. And sometimes the simplest things—elevators, escalators, watching airplanes load and unload—are the most entertaining to children. Now that I think of it, Half Pint Travel is also a valuable resource. :) You can download my airport scavenger hunt, and check out a dozen other distractions on our Half Pint Heroes page. Happy Tripping. What other tips do you have when your plane is delayed or canceled? Let me know below!